The SUE Solution’s team successfully completed the utility research, mapping, and inventory of this 7 mile corridor in Logan, Utah. The general scope of the planned reconstruction project includes widening and reconstruction of the SR-252 corridor (10th West). Due to the length of the project, SUE Solutions approached the project with the goal of identifying utilities with completeness, while also considering associated costs. SUE Solutions established a program that focused Quality Level ‘B’ (horizontal locating) and Quality Level ‘A’ (vertical locating) at critical areas within the project, such as intersections, which typically contain the most conflict points and difficulties. Based upon the project design scope, the areas between the intersections were not as critical and therefore a broader range of data collection was performed in these areas. 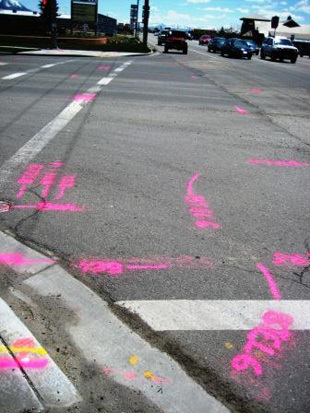 Approximately 182,000 feet of Level ‘B’ designated utilities were mapped throughout the project corridor. In addition to this number, an additional 67,000 feet was also mapped (Quality Levels ‘D’ and ‘C’), bringing the total utility footage mapped and located to approximately 249,000 feet (47 miles). 130 testholes, Quality Level ‘A’ locating, were performed throughout the project corridor, gathering crucial utility data such as depth, size, and material. 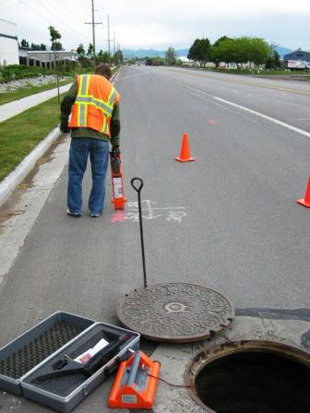 A comprehensive final SUE report was produced as a deliverable which contained utility (QL-B) mapping, photographic documentation, informational data sheets for the sewer and storm drain systems, survey data, testhole data sheets, and Utility Owners existing mapping.